I just love how people layer their bracelets. And before I wasn't really a fan of putting accessories on. I do put a pair of earings and that's it. But now I wanna try to be "in" lol! 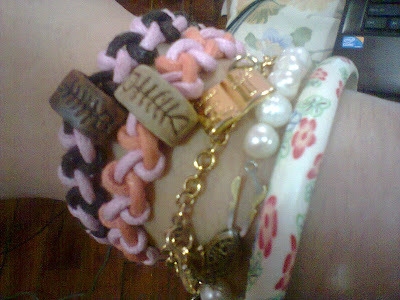 Oh I just got those two woven?/braided bracelets today. I soo love them! We also went to our fave thrift store! Haul coming up when I sort out everything 'cause I got pretty much a huge amount of clothes! Well who wouldn't? Everything for only..........50 pesos baby! So yeah we went a bit over board lol!